What is a radio system design? A system design is the only way to guarantee that your communications system will meet all of your needs, have proper coverage and receive the appropriate planning for successful installation, setup, and management. 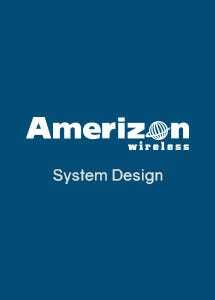 System Designs are the foundation by which any successful communications system is built. They ensure that every option is considered ahead of time to provide the best solution. When to get a radio system design? You should get a system design whenever you are investing in a system that has multiple repeaters and/or multiple locations. When you decide to have our professional team design your communication system, you eliminate surprises during and after installation. We plan ever detail from beginning to end, so you don't have to. If you choose to use Amerizon for provider, you will know what to expect from your system and can hold us accountable. System Site Diagram - A diagram showing system details, flow and connections. Networking Configuration Details - Useful when interfacing with IT staff. Site equipment rack configurations - Contains the details of rack equipment. Propagation Study - A report to discover coverage details around the site(s). System equipment overview - Contains specs and data for all equipment. To get started with your system design complete the form to notify our team that you would like to have someone contact you regarding a radio system design.